Welcome to Mindy's HotChocolate Restaurant and Dessert Bar. While we know that you have many dining choices, we wholly commit ourselves to exceed your expectations in all areas of your dining experience. From the moment you walk through the front door, it is our goal to provide you with an atmosphere that is comfortable and relaxed with exemplary service and an evolving array of high-quality, seasonal and locally-sourced food, drink and pastry. We constantly search for new and exciting purveyors, ingredients and presentations. Through our network of artisan farmers and friends, we are able to connect the producer to the consumer and provide a uniquely enjoyable dining adventure. 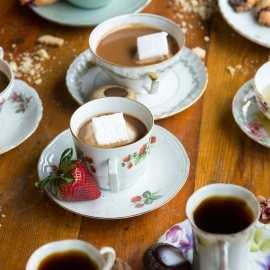 Whether it is a casual lunch, a leisurely weekend brunch, a delightful dinner or a late night dessert rendezvous, HotChocolate continues to be one of Chicago's most unique dining destinations. A dessert restaurant. Hip family-friendly American eatery is known for its seasonal fare, rich desserts & hot chocolate.